It's been a very busy week and weekend for me so I decided to go with a very fast and simple break. 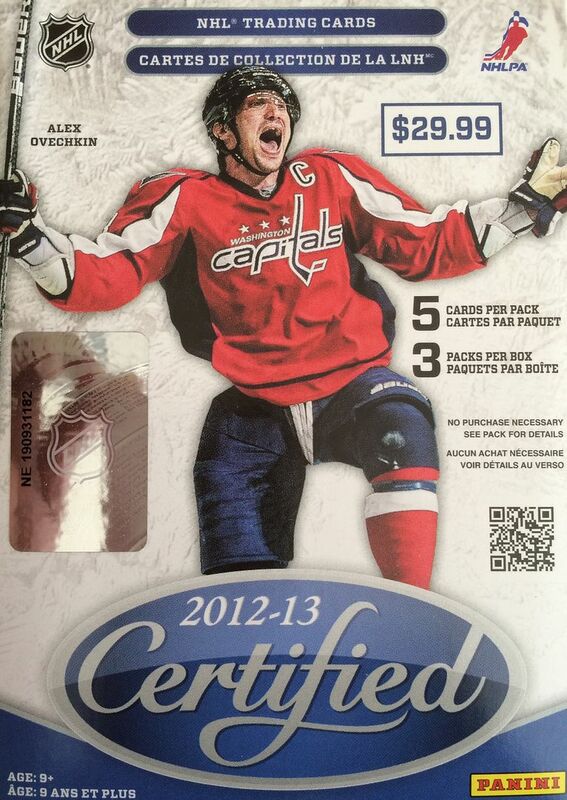 Panini Certified is awesome because it packs a nice punch in a very small package. There are only three packs per blaster, but one of the packs should contain a hit. The 2012/13 hockey season is not about finding rookies, in fact, it's probably the worst year if you're looking for first year cards. This was the lockout shortened season, and card companies did not release cards for the rookies that skated then. They NHL and the companies agreed to hold off on all rookie cards until the next year - making a double rookie class. When buying cards from this season, the best to hope for is to get some great veteran content. Though rookie content is non-existent, veteran cards can be found easily, and for a pretty good price! As I expected, this blaster gave me a quick and easy break that netted me a hit. The cards from this year's Certified are very shiny and easily attract finger prints - even the jersey cards have this full foiled look. This wasn't my favorite Certified design, but I think they would look pretty impressive coming out of the box to a new collector. They have that bling! The Nuge was all the rage when he was a rookie and set the collecting world on fire. I remember those times well, especially when I pull on of his cards. 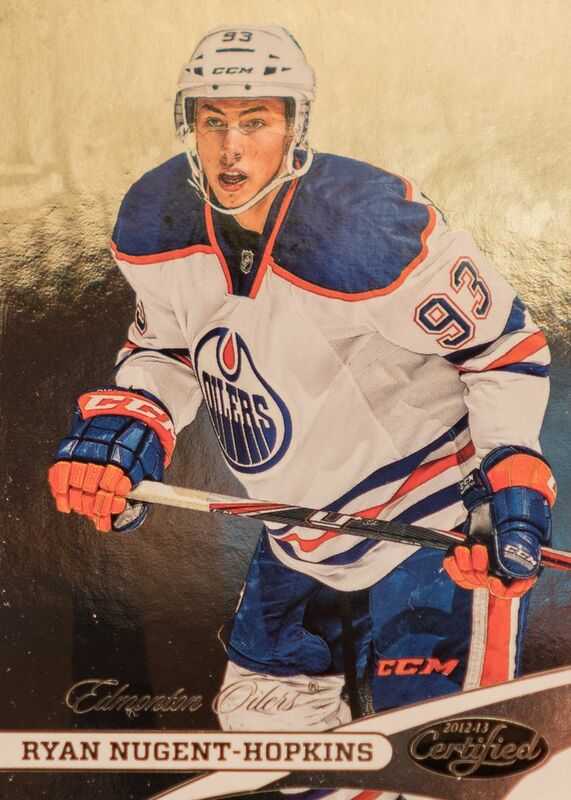 I also like that Panini gave him 93 for his card number to match his jersey. 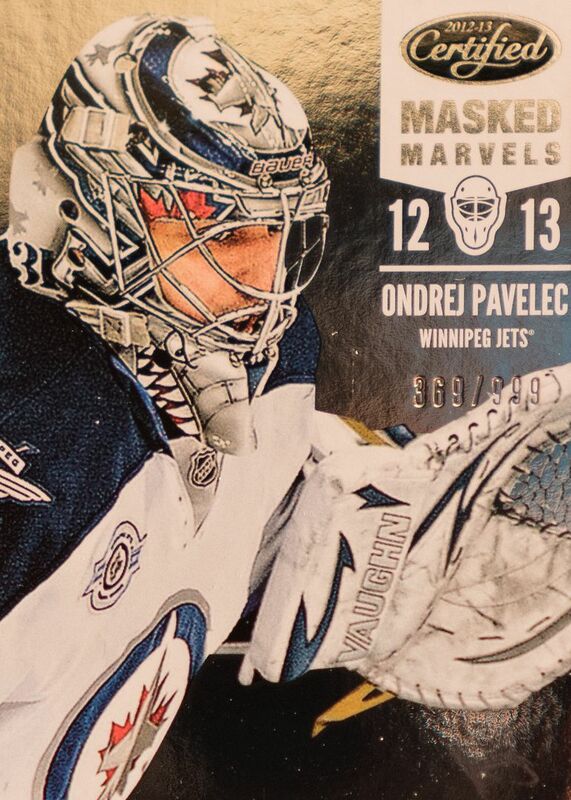 I didn't realize that the Masked Marvels were subset cards numbered after the regular base set and not a stand alone goalie themed insert set. I guess that makes sense though as Certified has always had limited subsets that came after the regular cards. 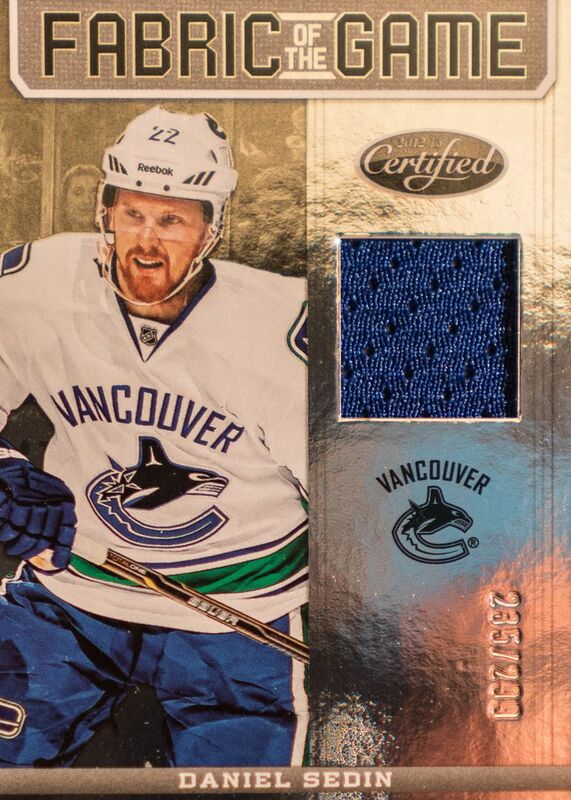 My hit was just a Fabric of the Game plain jersey swatch, but Daniel Sedin isn't a bad one to get. He's a solid star in the NHL, even though he plays for a franchise that is a rival of the Sharks. This was not a bad pull at all. For the price, I'd definitely recommend Certified right now. It's a fun product to open and it's always fun and exciting to pull hits out. Hopefully, the products from the 12/13 season stay at a nice discounted rate. I think they make a tremendous value for collectors.